Sensei Richard Small 4th Dan TIA Europe, teaching Aiki Jo in Bideford, North Devon. Member Instructor 'Ability Martial Arts Association'. 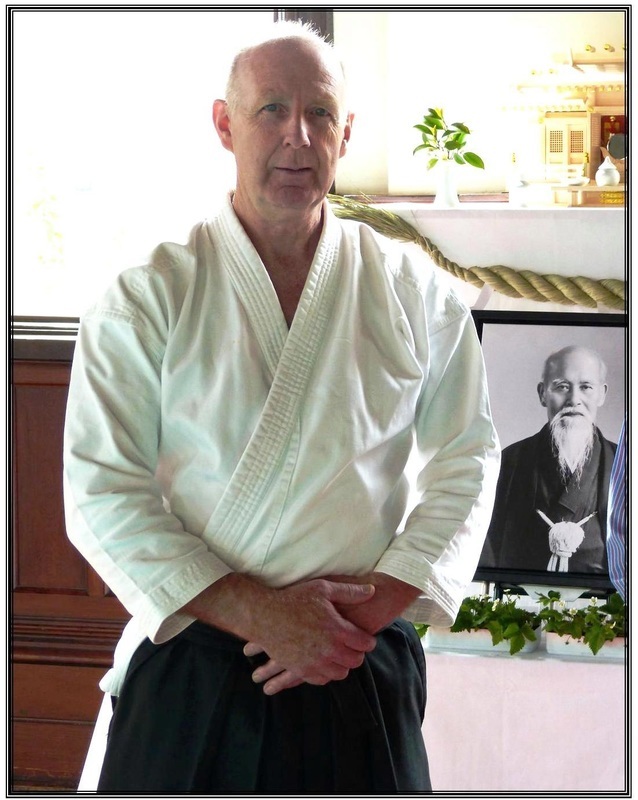 I started Aikido in the mid 1970s, at Sensei Aubrey Smith's Wellingborough club, then moving Counties for work, going oh so slowly through the grades until I was awarded 3rd Dan in 2007 at Cambridge by Sensei Tony Sargeant and Paul McGlone. Awarded 4th Dan April 2013. Some of the other teachers that I have seen on workshops or seminars are listed below, and in no particular order. Pat Hendricks 6th dan, Toyoda Shihan, Saito Sensei 9th dan, Bill Smith, 5th dan when I saw him, Terry Ezra, Mathew Hill, Alain Peyrache, Bill Harris, Miles Kessler, Kanetska Sensei, Chiba Sensei 8th dan, Shibata, Yamada Sensei 8th dan, Tamura Sensei, 9th dan - if not should be ... brilliant, Daniel Toutan, Andre Noquet, Kai Kuniyuke, Pat Stratford and many more. I've left a lot of teacher's names out but from each of them I learned something of value, each gave me pieces of the jig saw puzzle ..... and like a puzzle the solving of even small parts are delights of enlightenment ... then a something, from where we know not, gives us the answer that completes that puzzle .... but the shelf is full of new puzzles to enjoy. I'm not saying I can do what they do ... I just saw what they did ... hoping some inspiration would come my way, some small gem was always be mine to take home. I trained in Holland, Switzerland, France, Greece, Russia and Jersey as well as the mainland UK, I attended something like 130 courses, excluding teaching and coaching courses. I was lucky to teach at Sensei Sargeant's Orwell Dojo on a regular basis and was invited to teach in Holland while a resident teacher was on holiday. I like teaching, it gives me great satisfaction, and I am honoured to have been invited to teach on 'internal aspects' at Sensei Mark Allcock's Well springs of the east Dojo in Corfe Mullen, Dorset. It has also been an privilege to teach at Shinsei Dojo near Crewkerne, at United Dojos in Taunton and Hartland Aikido in Bucks Mills. Now living far away from the main group of my association I do not teach taijutsu ... lots of excuses, no mats, old age ...... but I particularly like the Jo. The simplicity of its requirements if not its applications makes teaching it as an art, opportune. Jo form being looked at - 20 suburi; 13 kata; 31 kata; 6 kata; partner work for the katas and applications for blending, blocks and parries as appropriate, awase, and an occasional look at Jo nage and dori. Recently we have started to train with the aiki ken, the 7 suburi and a couple of the kumitachi and occasionally tachi dori... recently some ken tai jo too.. However, as far as is possible this is principle based teaching and not just choreography. Principles should be a constant even if politics, egos, opinions and learning are not. We train slowly and purposefully in order that our bodies can inform our minds about what feels correct or not ...... and change what is asked of us. The idea is to develop, not just a few muscles, but an understanding of who and what we are and can be in life. Some might say,'you're just waving a stick about. ', but we know different, we are on a spiritual journey to visit self; self awareness leads to wisdom . . . another name for enlightenment. Taken at the Owell Dojo in 2004, Uke's David Law and Nick Hum. This was a rare opportunity for all the teachers to share what interested them at the time. Each had about 10 minutes or so. It was a special day. My thanks to TIA Europe and my teacher Tony Sargeant Sensei 6th Dan Aikiki. This technique interested me then as it related strongly to the principles of, 'I initiate, atemi, whole body movement and sensitivity'. It is what I believed in at the time.